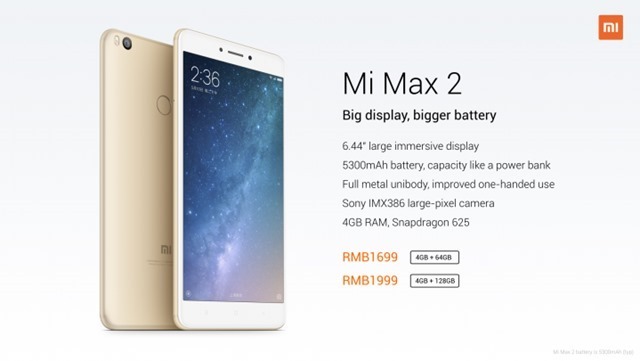 Xiaomi has officially launched the Mi Max 2 in China. The phone is the 2nd device in the popular big screen series, which debuted a year ago. 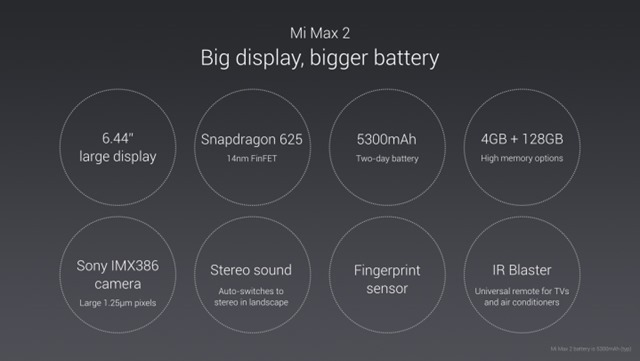 The Mi Max 2 sports a 6.44-inch Full HD 1080p display, has a pixel density of 342 PPI, 1000:1 contrast ratio and a 72% NTSC colour gamut. The phone is powered by a 14nm FinFET Qualcomm Snapdragon 625 clocked at 2.0GHz, 4GB of RAM, and an Adreno 506 GPU clocked at 650MHz. The phone comes in 2 variants:, one with 64GB of storage, and one with 128GB of storage. The device does support expandable memory via a microSD card, which is part of a Hybrid Dual SIM tray. Audio wise, the Mi Max 2 has bottom firing speaker grilles, and changes to stereo speakers when the device is used in landscape mode. 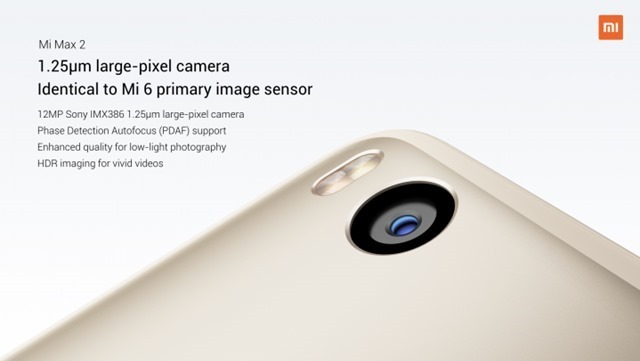 The Photography department on the Mi Max 2 comprises of a 12.0 megapixels rear camera with a Sony IMX386 lens which is the same as the one on the Xiaomi Mi 6, and has 1.25μm, an f/2.2 aperture, and supports Phase Detect Auto Focus, HDR, etc. The front camera is a 5 megapixels 85° wide-angle selfie lens, with an f/2.0 aperture. The phone has a rear placed fingerprint scanner, and an IR blaster on the top. 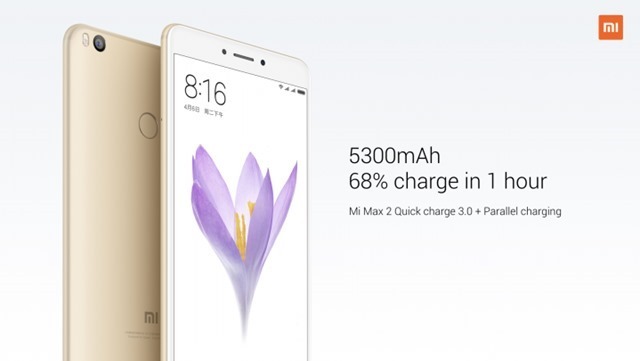 The The Mi Max 2 has a gigantic 5300mAh battery which supports Qualcomm Quick Charge 3.0, and parallel charging. The battery can be charged up to 68% in one hour. The phone has a metal unibody, has a USB Type-C connector, and weighs at 211g. 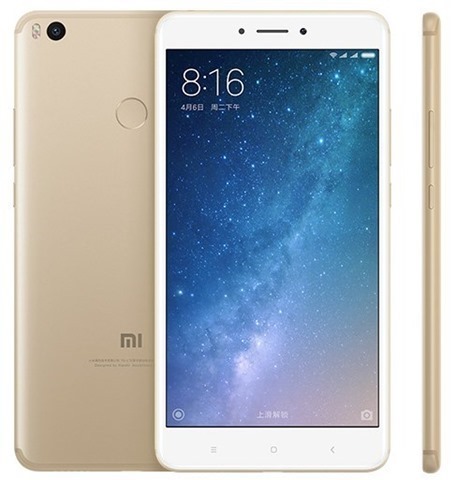 The Xiaomi Mi Max 2 has been priced at RMB 1699 for the 64GB storage variant, while the 128GB storage variant costs RMB 1999, in China. If launched in India, the expected price of the Mi Max 2 could be around Rs.16,000 and Rs. 19,000 respectively. Xiaomi India did mention that it might launch a new device instead of the Mi 6 here, so it is highly likely that the phone will be the Mi Max 2.